It’s been a windy and rough week for our fishing boats this week, most days with winds over 20 mph. It was also some of the best fishing we’ve had in months. 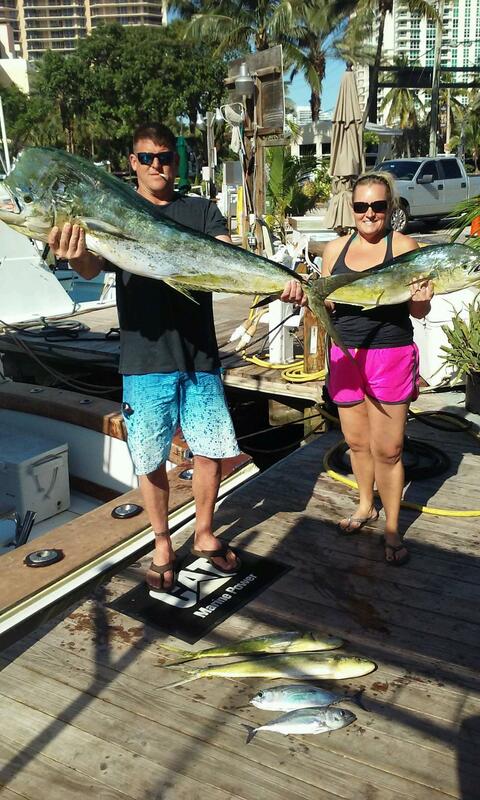 Mahi-mahi dolphin are snapping lately in only 100-300ft of water (that’s just a mile and a half offshore). The dolphin are mixed in sizes with most of them schoolie sized with a few monsters mixed in. We’re catching them trolling the inside edge of the Gulfstream and just outside the reef. November-December is always a good couple months for dolphin fishing but this year has been the best I’ve seen it in a while. The roughness of the ocean has helped a lot. The worse days for weather are invariably the best days for fishing. 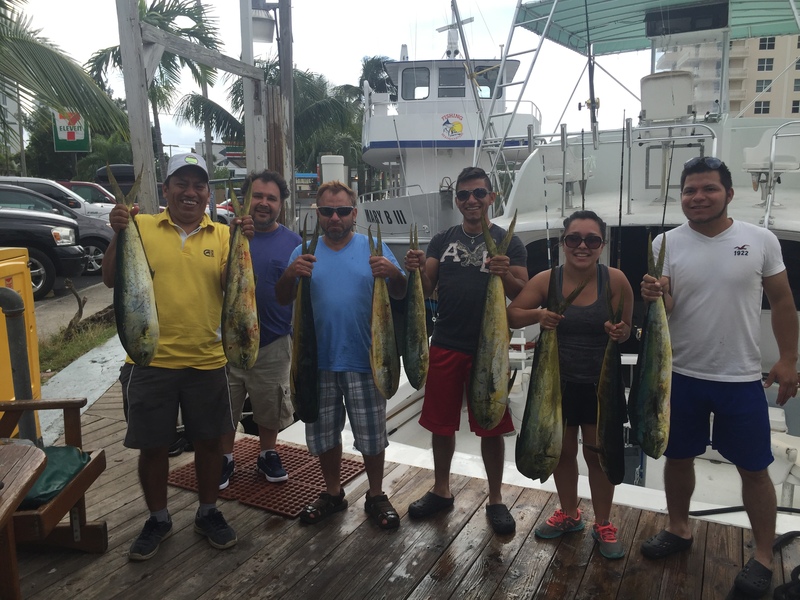 Nice dolphin catch on our sportfishing charter. 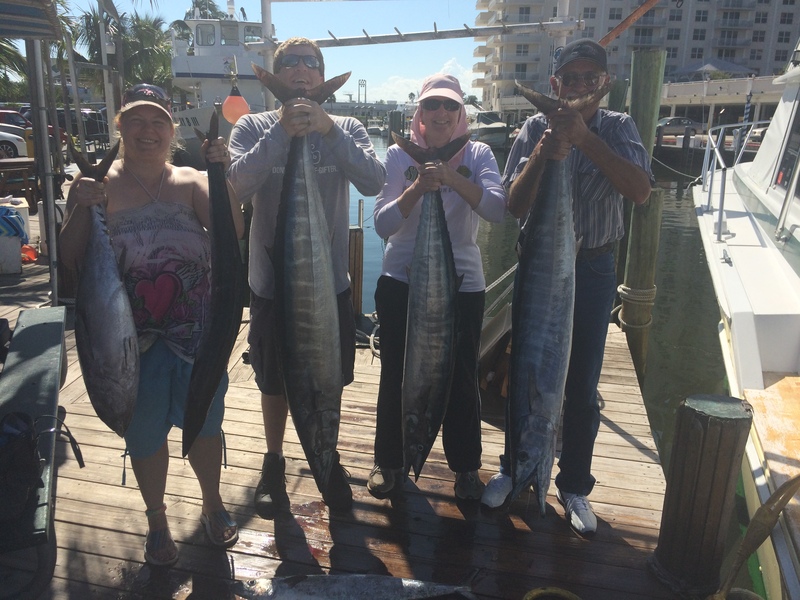 Trolling the waters in 100-300ft is excellent for catching dolphin this week, but that’s also prime territory for wahoo, kingfish and blackfin tuna. The moon is ripe for wahoo this week so expect to see some nice ones hit the dock. We’re getting a few right now but this upcoming week should be a great wahoo bite. Blackfin tunas are showing up on the reefs too. There’s lots and lots of little ones which can be caught easy enough with a small natural feather and a select few really big ones in the 25-35 pound range, caught mostly on natural rigged ballyhoo or live baits. Kingfish are also mixed into our catches and Nov-Dec is a great month for some of the larger kings. The super strong winds aid in one other thing this time of year, kite fishing. For kite fishing, a stiff, steady wind is a prerequisite. We’re deep into sailfish season now and they are active out there. We really haven’t had a cold front come through yet this year, but as soon as the first cold spell hits, we will an off-the-scale sailfish bite. 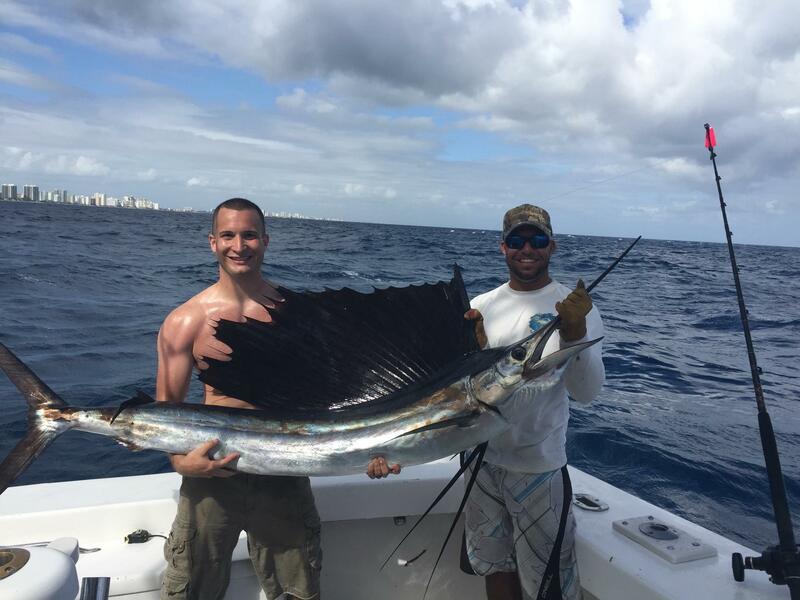 It’s regular for us to see 1, maybe 2 sailfish on a half day charter this time of year. Every time the weather drops below 70 degrees over the next 2 months, prepare for an epic sailfish bite with lots of sailfish bites all day long. There’s a lot of variety around this time of year. With the great action on the troll and perfect conditions for kite fishing, we don’t do a whole lot of bottom fishing. But the bottom fishing around the wrecks is pretty darn good too. 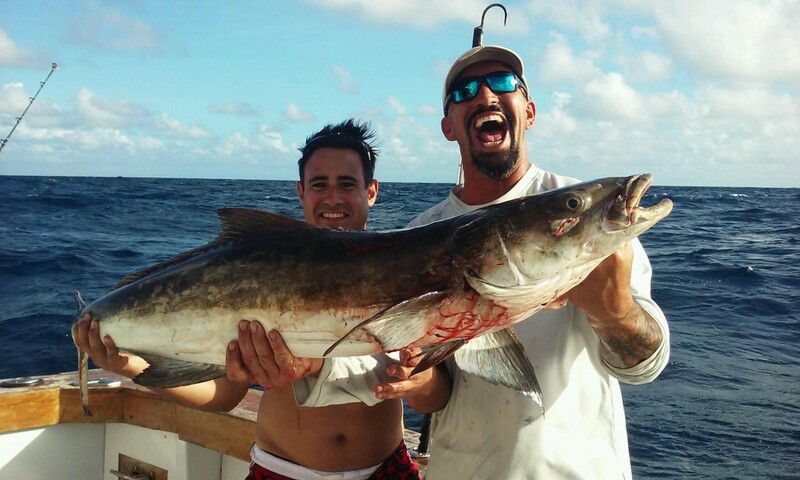 Amberjacks, groupers and cobia frequent the wrecks pretty regularly this season, so on the days when the bite slows down for trolling, it’s not a bad idea to go fish a wreck. Sharks come through around the wrecks this time of year too, so if you hook into a nice fish, get him in quick or you’ll end up with only half a fish. Sharks are very aggressive around the wrecks this time of year so we offer specialty shark fishing charters where we fish for big game sharks using serious big game shark tackle. 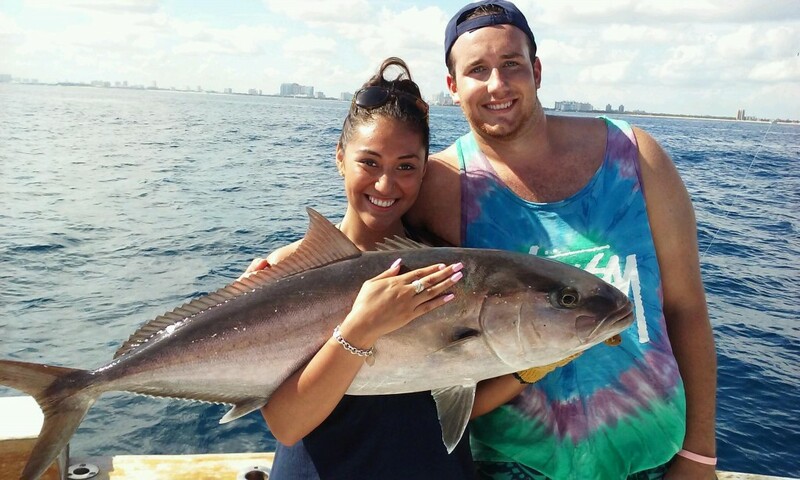 There’s a great bite happening over the next couple months off the coast of Fort Lauderdale. Good luck to everyone fishing. I’ll sea ya on the water. Very large wahoo just caught, estimated at 50 pounds. 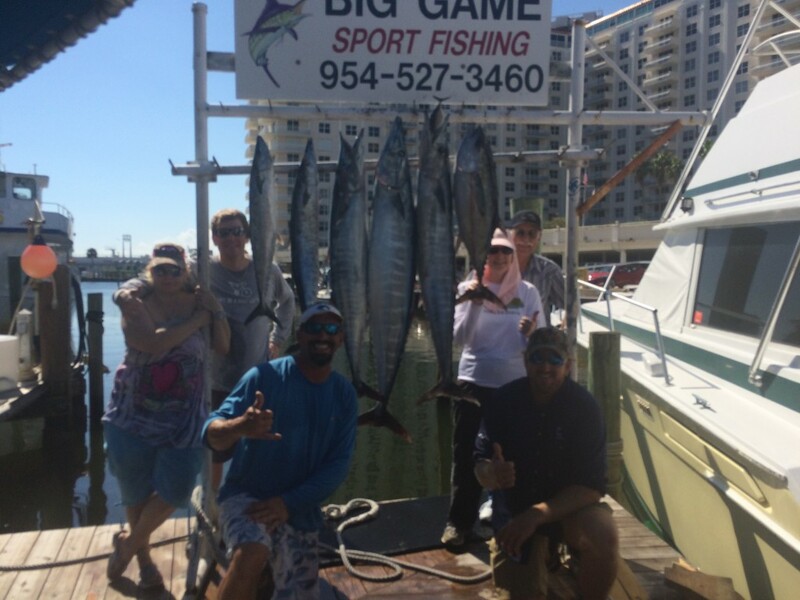 What a great trip we had yesterday with a total catch of 4 wahoo, blackfin tuna and kingfish… all in a half day sportfishing charter. The wahoos were snapping in 300ft of water off the coast of Fort Lauderdale. We were out on a half day sportfish charter and went immediately to slow trolling live goggle eyes out of the outriggers. There was enough wind for the kite but slow trolling allows us to cover more territory with the baits. On the first bite, there were 3 wahoos fighting over the long-rigger bait. The goggle eye was jumping out of the water, freaking out. The biggest one finally got it in its mouth and the two others swam up and ate the other 2 rigger baits. Once we caught those, and it took a while, we circled back through the same area and caught anther big wahoo, a big blackfin tuna and a nice kingfish. It was some serious action. The biggest one estimated 50 pounds and 2 out of 3 of the others were over 30. You never know what you’ll catch on one of our deep sea fishing trips. The fishing has been good this fall fishing season for us. 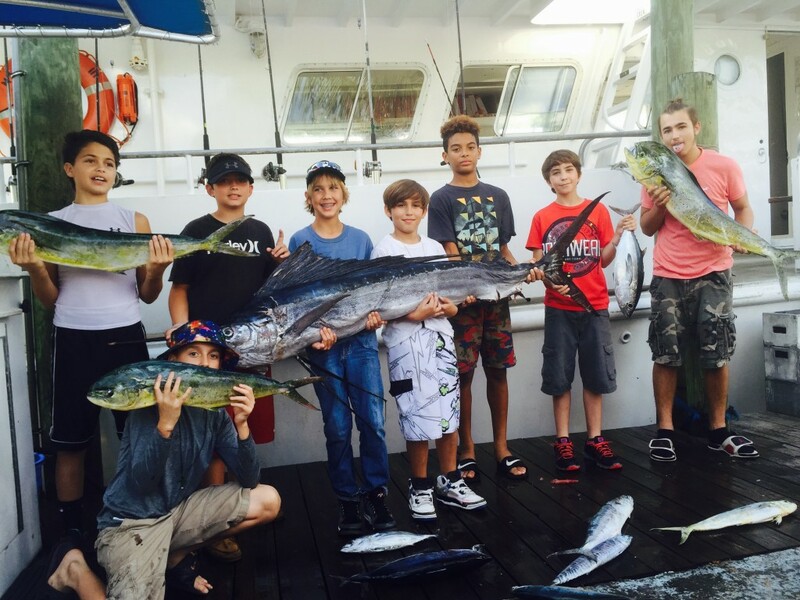 The mullet run always brings a lot of fish with it… dolphins, tuna, wahoo, sailfish and more. We catch some of our nicest fish of the whole year over the next month or 2. It’s been a little quiet on sailfish, but they will start snapping as soon as we have our first cold front. For now, mahi-mahi are biting very good on the outside edge of the reef, some of them quite large. Wahoo are lurking the same area. 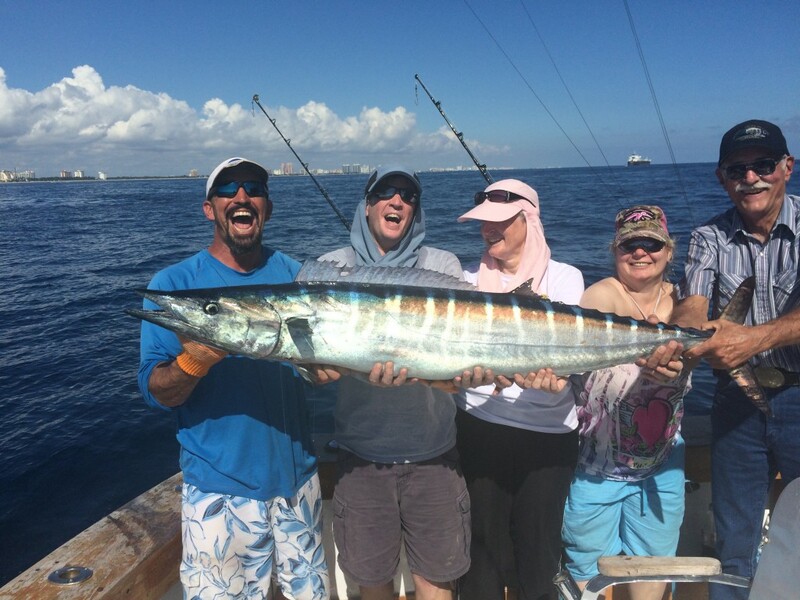 Bonitos, kingfish and tuna are biting pretty good on the reef. It’s been excellent trolling and live baiting lately. Good luck to everyone fishing over the next few weeks. I’ll sea ya on the water.